Louis enjoyed painting, calligraphy, creating cartoons, and drawing. He was very detail oriented. While stationed overseas during the Korean War years, he painted several portraits of his buddies and sent them home with them. Many other paintings hung in his own home until he passed away in 2004. All of these paintings are currently in the care of his daughters, Barbara and Linda, and will be passed on to his grandchildren and future generations. The only painting, not nearby, hangs in the “Capozzoli” room in Barbara and Linda’s east coast home in Owego, New York. This special painting hung for many years at the home of Louis’ parents, John and Maryann Capozzoli. Now it is quite prominently placed in a room designed to honor Louis and Capozzoli ancestry. Shown below is a self portrait of Louis done in 1953 while serving in the Korean War. It is from a photograph taken of him. Msgt. Ivan “Hooch” Evens was the only Marine enlisted pilot to fly in combat during the Korean War, and as an attacker bomber pilot flew in the next-to-last mission before the armistice was signed in June, 1953. A few weeks before, he took Louis on a dive bombing run against enemy positions. 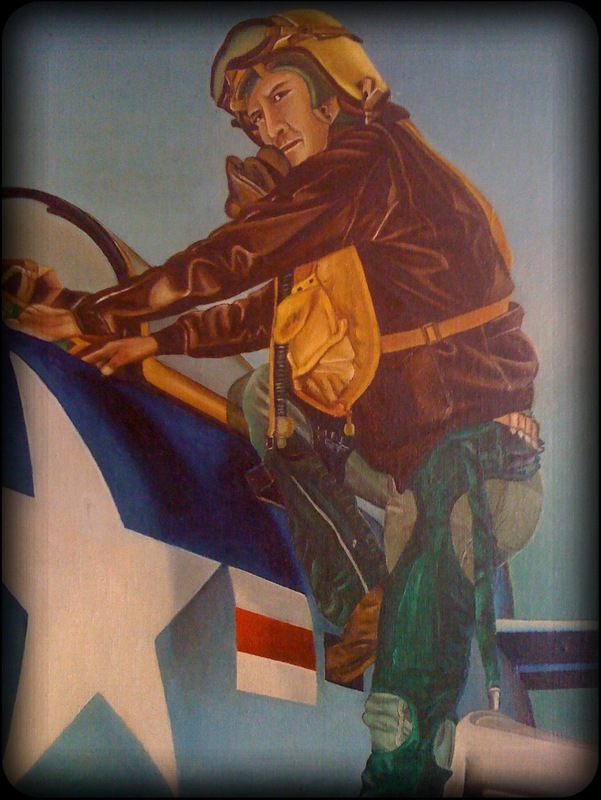 Louis finished his oil painting of “Hooch” climbing into his jet, June 1953. He called it “Marine Jet Pilot”. Louis directed 27 correspondents, radio reporters, photographers, cameramen, clerks, and Korean darkroom technicians to cover more than a dozen units and their men. They were located throughout Korea and Japan, as well as, aboard an aircraft carrier in the Sea of Japan. More than 400 news releases, features, photos, and radio interview tapes were sent out to the States every week. In addition, Louis and the two PIOs rotated and wrote a news release summarizing the Wing’s daily combat activities. During this duty, Louis visited many sites. One week after arriving in Korea, he visited the First Air Wing sponsored orphanage in the nearby town of Pohang-dong. Louis and his crew were allowed to take many photographs after trading the cigarettes Pop-a-san demanded of them. Louis’ personal photo album depicts the difficulty of life for the people of the villages, with their shacks, broken down vehicles, and heavy workloads. 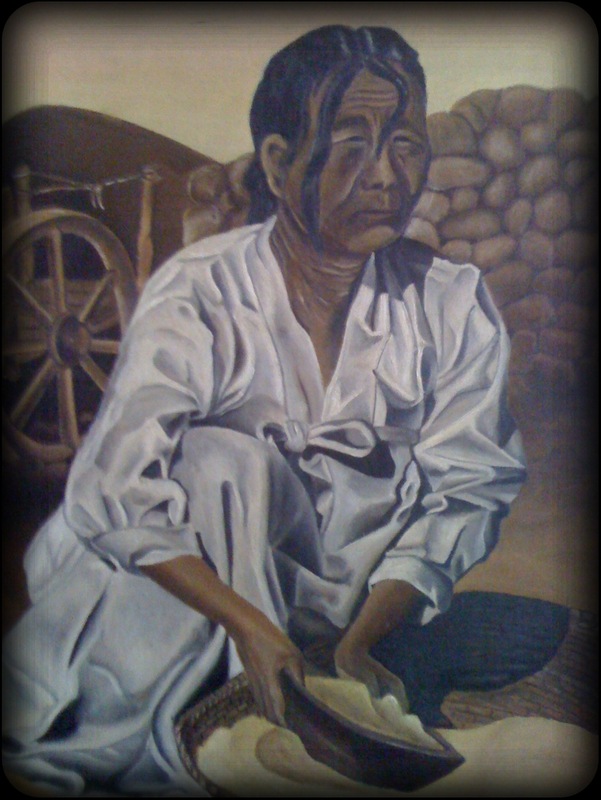 Louis’ first oil painting, “A Korean Farm Woman”, is very prized by his family. It was completed on March 30, 1953. In his personal photo album, Louis is shown in uniform admiring his oil painting just after completing it. Through his art, Louis left us with a moving depiction of the hard work, drudgery, and sadness, seen on this woman’s tired face. She peers out of her tired eyes as she works to prepare food for her family. His folds in her white gown are magnificently painted. This became the trademark of many of his paintings in later years. There is no question that Louis proved himself to be a very talented artist from his very first painting. Whether it was painting, writing, or photography, Louis shared the story of the Korean War with others. This painting hangs in his daughter, Linda’s, home at the present time. One of Louis’ outstanding oil paintings is that of a Marine soldier. The painting is not signed by Louis. It is painted on the back of a cardboard poster which depicts several Marines kneeling in a battlefield under the night’s stars and praying together. Louis made the frame for this painting himself and entered the painting into an art contest. He taped a typewritten note on the back of the painting which he wrote himself. He states, “I have no art instruction whatsoever. In February, 1951, I decided I would like to paint and bought an oil set. I began painting in oils. To date I have painted eight paintings in size of at least 18″ by 20″. I have since come to regard oil painting as my hobby and contemplate enrolling in a Commercial Art course in the near future.” This painting was entered in the Novice category of the contest. Louis was stationed at the Marine Corps Recruiting Station, 751 Figueroa St., Los Angeles, Ca., at the time and was a Master Sergeant. His painting did not win. Again, Louis’ natural talent and abilities shine as an artist and communicator. This handsome Marine soldier is dirty, unshaven, tired, and smoking his stress away. One must wonder what this soldier has gone through or what is to come for him. Louis’ trademark folds in clothing can be enjoyed once again. This painting is on display in his daughter, Linda’s, family room with several of his other paintings, drawings, medals, and service awards. Going back again to 1952, while living in Whittier, Louis continued his hobby of oil painting. The photograph below is of Louis finishing “The Clown”, November, 1952. This painting hung in his girl’s bedroom while living in Whittier, and later Milwaukee. Though the photo is in black and white, the clown was painted in several bright primary colors. Once again, the folds in the clown’s costume are beautifully done and a natural depiction. This painting is currently in the possession of his daughter, Barbara, for safe keeping.